www.danielagnew.com: Another Sonnenberg wood and composition toy, a cat eating and mouse. Another Sonnenberg wood and composition toy, a cat eating and mouse. This is a really interesting toy, a wooden box with a hole in the front. 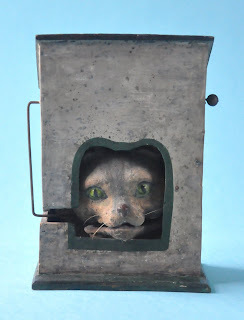 A cats face protrudes through this, when you turn a handle at the back, a mouse comes out of a flap at the back of the toy, over the roof and as it comes to the front of the toy, the cat opens it's mouth and swallows the mouse. The most exciting thing about this toy is the shop label on the reverse. `H.J. Curry's Toy Warehouse, 203 Sloane Street'. This is now a very fashionable street in London, near Harrods. It has all the high end shops along it, Gucci, Graf, Channel etc. I spent some time in the Kensington library and looked in old London commercial directories; Henry Joseph Curry is listed in the 1846, 1849 and 1852 issues. It is listed as a bookseller and stationer; in the 1879, 1891 and 1902 directories 203 Sloane Street is still a toy shop, but owned by Rose. Thos. Peter Toy Warehouse. The toy is 6.1/4in. (16cm.) high and must date from the mid 19th century. What a fascinating find! Thank you for posting this.